Sometimes newborn photos are sentimental and sweet. Other times, they're perfectly hilarious. 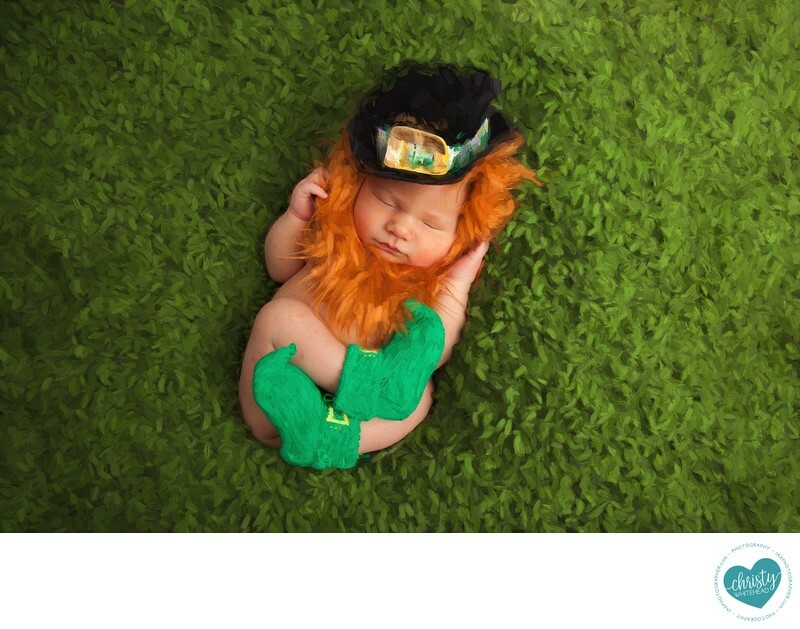 For the longest time I had this little Irish hat and beard prop but hadn't found the right baby to use it on. Then along came this sweet little Irish baby whose momma actually had the boots. This ended up being one of my favorite photos from the newborn session. Not only is it adorable but we laughed so hard setting up this photo. How could you not?! This grassy like backdrop reminded me of a field of clover and I thought it was perfect. The only thing missing was a pot of gold and maybe a rainbow too. I love getting clients who have a great sense of humor. This image was too fun not to pass up and I'm sure it's going to be one that sparks a story or two when they look back on it in the years to come. I can't help but wonder if it's the newborn photo that will be used during his graduation party. The one that gets pulled out at all the family get togethers. Who knows, maybe one day his own baby will wear a similar outfit during his newborn photos, just like dad.